A top layer that helps you feel light. This men's running jacket is built from climalite® fabric to pull sweat away from your skin and keep you dry and comfortable. 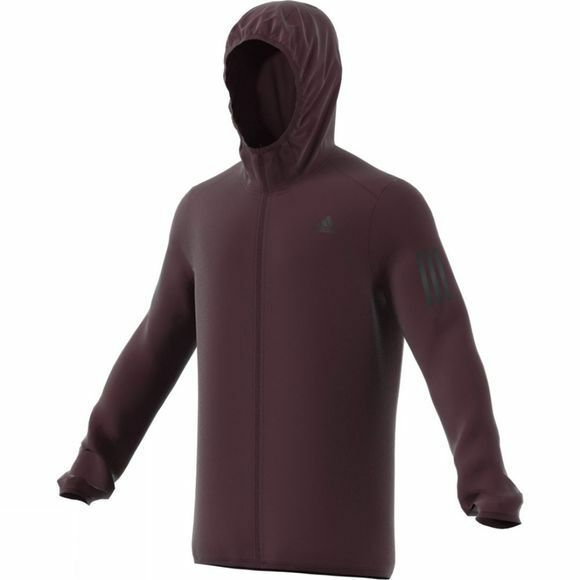 The full-zip front and hood with elastic opening lets you adjust for just the right amount of coverage. A sweat-guard pocket stores small essentials. Adidas is driven by a desire to help athletes perform better, play better and feel better. Their products break records, set trends and make history. Every day. All over the world. But it’s not all about faster shoes and fashion statements. Just as there is more to a shoe than padding and foam; Adidas is more than the sum of its products. At the heart of the company is an extraordinary passion for the sporting lifestyle, carried by the dedicated men and women who work for it. And so, for Adidas, shaping the sporting goods industry sustainably is more than a job; it’s an impulse.